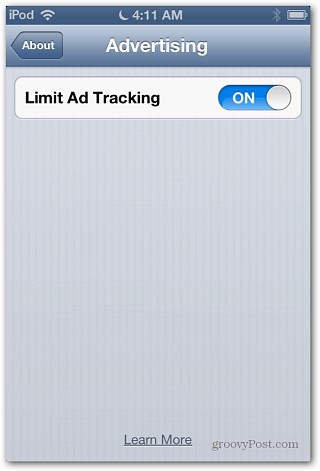 With iOS 6, Apple has taken the liberty of opting you into adv tracking. Not keen on the idea of automatically being opted into ad tracking? Turn it off. 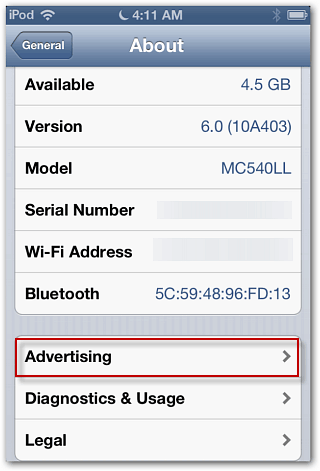 With iOS 6, Apple has taken the liberty of opting you in to advertiser tracking. The tracking doesn’t track you personally, but does track how you use your device, and targets ads based on your behavior. 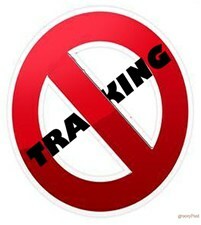 If you don’t want to be part of this type of tracking, you can turn it off. 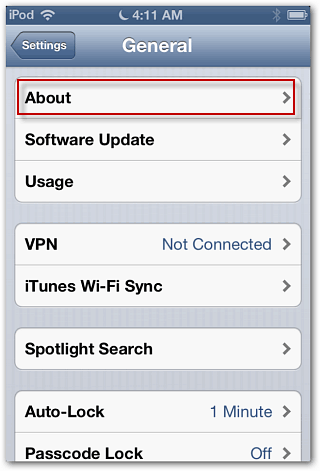 These new identifiers are random and anonymous numbers assigned to your device. When you browse the web in Safari or use an app (basically anything you do on your device) a call is sent out for a targeted ad based on your usage history. You’re not being tacked personally, but your browsing and purchasing activity is. In a nutshell – you’re being delivered specific ads based on the apps you use and sites you browse on your iPhone, iPad or iPod touch running iOS 6. On your device go to Settings >> General the tap About. Then scroll down the About screen and tap on Advertising. Next turn Limit Ad Tracking to ON. 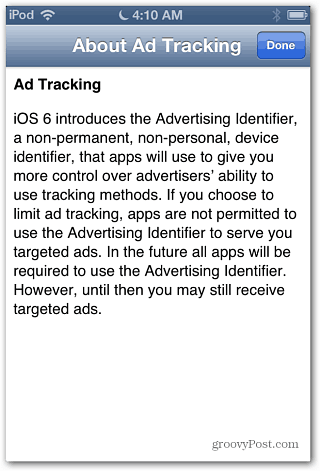 If you want to read Apple’s explanation of Ad Tracking, tap Learn More. Which interestingly says that “you may still receive targeted ads.” This would apply to apps like Facebook or ads in Lite versions of games for example. I don’t think this is a huge privacy concern. In fact I would rather see ads for things I’m interested interested in, rather than random ones that I don’t apply to me. But, if you’re not keen on the idea of automatically being opted in to ad tracking, you can turn it off. To learn more detail about how Apple is tracking your behavior and the intricacies of how it works, check out this article from Business Insider.